David got more powerful and God was with him. AoV1-137 / ATOK 403 / GA306 / G(II)286 God of Abraham lead us (Bernadette Farrell) I love this energetic call and response with the response "Lead us to your kingdom". Strangely, it doesn't mention David. Perhaps you could make up a "God of David be with us" verse. Don't try to sing all 17 verses! Choose what you like... You can sing with a cantor and response, or you could split your congregation in the middle doing half and half, or you could just have people singing all the way through. Lyrics (downloads a pdf). Good for kids. NCYC2007 Lead me on (Paul Gioia) A pretty cool gospel rock song from the NCYC before last about God leading us through difficult times. Good for kids & teenagers. MV048 I can feel you near me God / Jump for joy (Pat Mayberry) Good song for smaller kids about God being with us. I reckon you could get the kids to Jump in the chorus. Maybe it's a bit too happy clappy for some? Lyrics. Good for smaller kids. God is steadfast and eternal and victorious. TiS 626 / AHB 557 / CH500 / GA423 / Lau869 / StF449 / MP440 Lord of creation to you be all praise! (Jack Winslow) A wonderful traditional, and quite inclusive, hymn to the familiar tune SLANE. Lyrics. New words to old tunes. 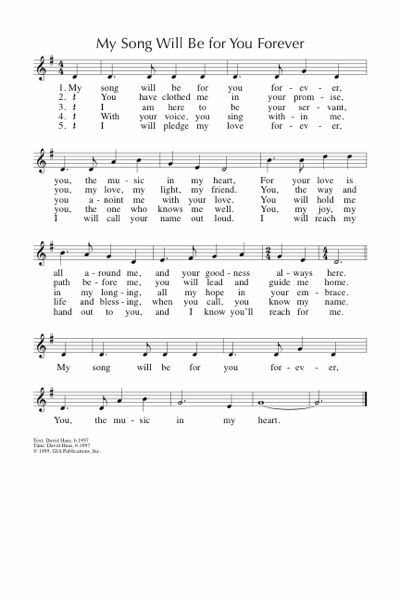 NCH Psalter We ponder your steadfast love O God (Martie McMane) A lovely simple refrain and a cantor part which may be read or sung. Online Resource Stronghold (Richard Bruxvoort Colligan) A good reflective refrain and simple verses. This is available free for the next 7 days. Sound sample, lyrics, downloads. Songs for Liturgy 05 Holy God holy and mighty (Georgian) Not for the congregation, but if you have a small group of singers, or a choir, this would be beautiful. The Republic of Georgia has beautiful liturgical music, this version comes from a book published by the church of St Gregory of Nyssa in San Francisco. For more Georgian Trisagion's search for "Tsmindao Gmerto". You might find something beautiful like this. NCH748 / STB122 Holy God holy mighty (Francisco Feliciano) Another good Trisagion - more appropriate for the congregation to sing this time. TiS 569 / AHB 478 / NCH18/19 / CH167 / UMH127 / VU651 / LBW343 / ELW618 / StF465 / A&M652 / HPP432 / GtG065 / PH281 / CP565 / CP(E) 455 / W&R501 / Cha622 / 82Hml690 / StF465 / Lau960 / LUYH043 / MP201 Guide me O thou great Jehovah / Redeemer (William Williams) A rousing hymn of God’s presence and strength and making it to the other side. "Bread of heaven, feed me now and evermore." Sound sample and lyrics. Oldy-but-a-goody. Emergent Psalter Tell the next generation that this is our God (Isaac Everett) A good chant with a psalm read over improvised chords. Sheet music (click on the downloads tab). PfAS048B In the midst of your temple O God (Gregg DeMey) A simple 3/4 refrain to a chanted or read version of the Psalm. Taizé / CH801 / MV170 / StJ / GtG205 / WoV665 / ELW642 / SFFS 2179 / GC408 / GC(II)430 / G(3)500 / CP553 / W&R399 / Cha523 / URW394 / StF783 / Lau244b Live in charity / Ubi Caritas (Taizé / Jacques Berthier) Usually sung in Latin, but can also be sung just as beautifully as "Live in charity and steadfast love, live in charity; God will dwell with you." Sheet music and sound samples for practice. Good for kids. GC(II)615 / G(3)704 My Song Will Be for You Forever (David Haas) Lovely words and a simple chorus. The sound sample makes it sound like a musical theatre piece, but I think it's good for a congregation, or a choir, or at least for the congregation to join in the chorus. Sound sample. Sheet music sample. Or purchase here. TiS 658 / AoV1-090 / ATE 296 / CH251 / UMH593 / VU509 / WoV752 / ELW574 / GA496 / A&M494 / HPP541 / GtG069 / PH525 / G(II)492 / GC(II)671 / G(3)777 / CP(E) 470 / W&R559 / Cha452 / Srce328 / Lau865 / StF663 / LUYH869 / MP857 I the Lord of sea and sky / Here I am Lord (Dan Schutte) Song of God searching for us and our response. Very slow sound sample. Lyrics and sample sheet music. TiS 674 / Iona (Common Ground, Heaven Shall Not Wait) / A&M562 / CH253 / SP245 Inspired by love and anger (John Bell) Powerful lyrics, simple English folk tune. Lyrics (search for "inspired"). I love verse three “Don’t query our position! Don’t criticise our wealth! Don’t mention those exploited by politics and stealth!”. Have mercy on us. We’re tired of people looking down at us. You might like to sing a Kyrie. Linnea Good To you I lift up my eyes (Linnea Good) A simple response. Good for kids. Taizé / TiS 725 / ATE 275 / AoV2-167 / ATE 275 / StJ / GA538 / GtG678 / G(II)553 / GC763 / URW391 In our darkness there is no darkness in your sight / La tenebre (Jacques Berthier) Also translated as "Our darkness is never darkness". Sample music and lyrics. VF091 Heal me Lord (Carol E Petersen) A beautiful and gentle two part song for healing and mercy. You could use a cantor for Part 1, or separate the congregation into two parts. I think you could also easily make up your own verses to fit your congregation. TiS 674 / Iona (Common Ground, Heaven Shall Not Wait) / A&M562 / CH253 Inspired by love and anger (John Bell) Powerful lyrics, simple English folk tune. Lyrics (search for "inspired"). I love verse three “Don’t query our position! Don’t criticise our wealth! Don’t mention those exploited by politics and stealth!”. It’s easy for us to be judgemental on these things. Traditional / ATA 202 / GGives1 We're gonna move when the Spirit says move / I'm gonna sing when the spirit says sing (African American) Based on a traditional song. Some versions are "You gotta sing…." Many versions exist, you can even make up your own words. Lyrics and sheet music. Emergent Psalter The snare is broken (Isaac Everett) A simple refrain to a read Psalm with improvised music during the reading. Sample sheet music. Online Resource We lift our eyes to you (Richard Bruxvoort-Colligan) A gentle song of moving on from the fear of terror and sorrow. It would be a beautiful meditation. Lyrics, sound sample and sheet music. A near death experience of a friend.... When we are weak, God is strong. Tune in / Online Resource The God that I Know (Sheree Anderson) A beautiful ballad with female and male images of a loving, embracing God. “He comes with his arms open wide, a sheltering place I can hide”. 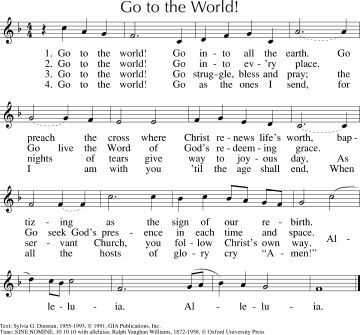 If this is not familiar to your congregation it would be a good song for a soloist. Free downloadable songbook, lyrics and sound samples. AoV2-070 / ATW 496 / MV090 / StJ Don't be afraid (John Bell) Excellent. I love this song of reassurance. "Don't be afraid, my love is stronger, my love is stronger than your fear". This song can be used as a response to intercessions. Good for kids. 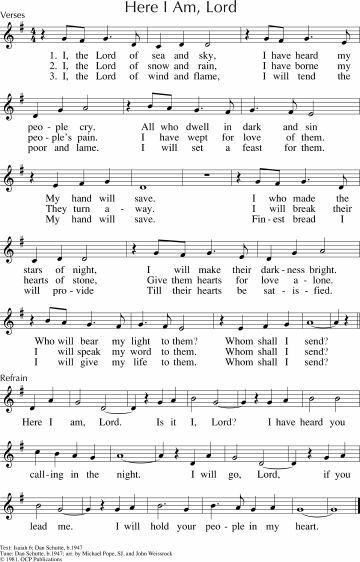 *CH655 / URW082 For your generous providing (Leith Fisher) Lovely words to the well-known hymn tune HOLY MANNA. Particularly good if you celebrate communion this week. "Through the depths of joy and sorry, though the road be smooth or rough, fearless we can face tomorrow, for your grace will be enough". BUC people: I have a copy of this. New words to old tunes. *Iona (M&G) / CH524 Jesus Christ our living Lord (John Bell) This is a new one to me. Quite simple, and encouraging words of service and simplicity. I think this would be a good one to learn and remember again and again. SP&P107 Great is your faithfulness O God of Jacob / Your grace is enough (Matt Maher) This very popular Christian rock song is pretty good. Note that the lyrics on most of the recordings are not the same as in SP&P. I quite like the changes he made for SP&P. The chorus is a bit repetitive, but "Your grace is enough" bears repeating really. Youtube. TiS 129 / AHB 56 / AoV1-029 / ATA 131 / NCH547 / CH555 / UMH378 / VU266 / LBW448 / ELW779 / A&M587 / GA437 / HPP334 / GtG649 / PH280 / G(II)434 / GC612 / GC(II)586 / G(3)645 / CP352 / CP(E) 375 / W&R422 / Cha546 / ZSS202 / Srce25 / Lau846 / StF440 / MP031 Amazing grace how sweet the sound (John Newton) I once was lost... I think you all know this one. Nice youtube of some Sacred Harp singing, and a story. I love the recording of G Yunipingu singing this in Yolngu; so sad that he is no longer singing on this earth. Oldy-but-a-goody. CH350 / UMH263 / VU358 / StS044 When Jesus the healer passed through Galilee (Peter Smith) A simple song with many verses (you don't have to sing all of them! ), and a simple "Heal us, heal us today" refrain. This would be good for kids or those who can't read, as they'll be able to join in easily. Verse 5 is particularly appropriate "The twelver were commissioned and sent out in twos, Heal us, heal us today, to make the sick whole and to spread the good news, Heal us, Lord Jesus". Good for kids. G(3)759 God Sends Us Forth (Tony Alonso) A folksy 6/8 minor key song of sending out. Sheet music sample and sound sample. GtG162 O carpenter why leave the bench (Richard Leach) Good words questioning why someone would leave a practical vocation to follow God's call. Good question, eh? Tune is an old American tune, not familiar but very singable. Good on you William Billings for writing so many good tunes. Iona (Common Ground) / URW177 Til all the jails are empty (Carol P Daw) A song about the work that we need to do in the world, and a prayer that the seed we sow will grow. What will you be singing? I'd love to hear your ideas. Please add them in a comment below!